SX 931 567. This is an important shore dive site largely because it is so accessible, safe and usually diveable unless N, NE or E winds blow it out. Ideal for all sorts of dive training. Breakwater beach is well known to dive clubs up country, and for many trainee divers it is where they have done their first sea dive(s) after weeks training in the pool. Depths of up to 10m with little current to worry about. A lot of sea life – sole, scallops, pipefish, crabs and so forth. Shore entry is straightforward. Good car park facilities – although not cheap in season. Cafe (daytime) and toilets. Very popular with the general public, and likely to reach diver saturation over Easter. SX 924 567. This dive site is for desperate divers. Access is very easy as is the car parking. Maximum depth is around 10m on a largely muddy, silty bottom. Vis is not often superb. Be careful of easterlies. The best way is to hug the shore as you go out. The central channel is well used by yachts and fishing trawlers and it would be foolish to emerge without warning. A SMB is a good idea, but don’t rely on water users knowing what it means. If in doubt contact the Brixham Harbour master. SX 938 568. 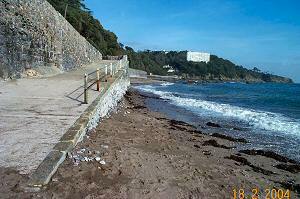 Not to be confused with Breakwater beach, Shoalstone lies between Breakwater and Berry Head. This is a good site. Parking is easy, although in season a charge is made. Maximum depth is around 16m. Access is straightforward, although some clambering over rocks is needed. Sheltered from anything but easterlies and north easterlies. Not advised for a night dive. Most divers just kit up and head out seawards (ie. North). This way you pass over some nice reefs with lots of things to see. Further out the sea bed turns to a muddyish shingle with many crabs and scallops. Be careful about tides. The ebb tide can take you eastwards towards Berry Head which is probably not where you want to go. Compass work is important here. Not a dive for novices. SX 818 388. 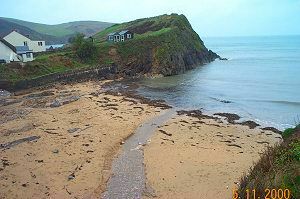 Hallsands is a famous Devon dive site – partly because of the Hallsands Hotel which welcomed divers and provided air fills. Alas the hotel is now closed and diving facilities are not available. However, the car park is extensive and free and shore diving is easy. The site is protected against the prevalent south westerlies and provides calm shallow diving which is particularly suitable for novices and training dives. The rocks extend underwater to give reefs intermingled with sand. Depths up to 15m. Much sea life and a lot to see. If you swim out too far from shore then be careful of strong currents. SX 675 401. A famous Devon dive site. This picture shows Outer Hope which in warmer, calm weather is a favourite family and holiday beach. The beach is exposed to south westerlies, but is otherwise sheltered with no currents. Maximum depth around 12m. Car parking is excellent, access is straightforward and there are lots of facilities present for both divers and non divers. Can be very crowded in the summer months. Good night dive site. Underwater, there are lots of reefs separated by sand. There is abundant sea life and visibility can be well over 10m if it hasn’t blown from the SW for a while. 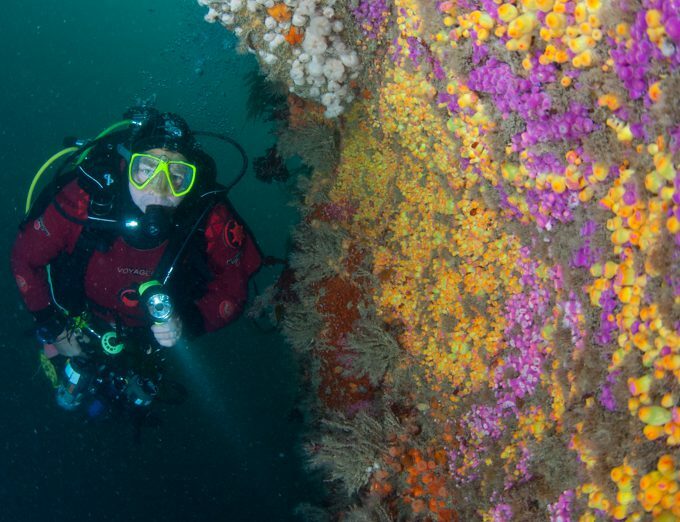 There are many dives one can do from here, but the most popular either involve going around the Shippen Rock (as shown in the photo) or else going straight out to sea and back again. SX 802 371. 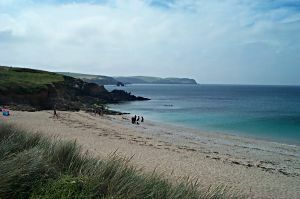 Lannacombe is a very remote beach not far from Start Point. 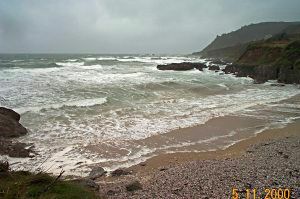 This photo shows the beach as a force 9 SE gale is beginning to blow! It is exposed to southerlies. In calmer weather there is a nice sandy beach with rocks on either side. Very limited car parking (get there early) and no facilities of any kind. There are some splendid cliff walks that non-divers can do from here. Access is straightforward at high tide. Maximum depth – 15m. Night dive possible if there is adequate shore cover. It is not advisable to swim out to sea too far since there are very strong offshore currents. Within and around the bay there are some nice rocky ledges and reefs with abundant life. If the weather is calm then this dive site is rather pleasant in an unspectacular way. SX 897 604. 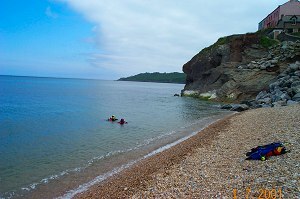 Fairy Cove is an ideal shore dive for novices. The depth hardly gets more than 8m and the site is sheltered from all weathers other than easterlies. 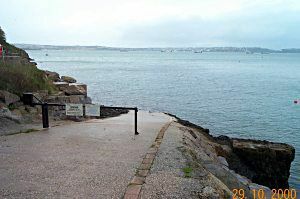 Although Torbay is not renowned for good visibility there is no run off from rivers at this site and visibility can be good. Access is easy, and parking is little problem although a little walk may be needed. There are excellent dive facilities nearby in the daytime, and the bay is ideal for non diving families. The dive takes you over shallow reefs with a bit of sand. Quite heavily kelpy and lots of wrasse and crab. There is some wreckage around from 3 old warships. SX 776 353. This is rarely dived – not least because access is awkward and requires walking 100 yards over a field with full diving equipment. Park at the National Trust carpark near to the Prawle Point coastguard cottages. The carpark is quite small so get there early in season. No facilities, but there are nice coast walks from here for non divers. The cove is quite sheltered and rocky. Lots of kelp but lots of sealife as well. Vis is often quite good and apparently good underwater pictures are taken here. Be careful of tides if you head out of the bay. The currents are strong around here. This site is hopeless if a South West wind is blowing. SX 492 507. 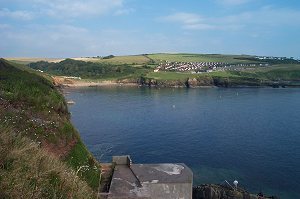 Bovisand Bay (not to be confused with Bovisand Harbour) is close to Fort Bovisand. It faces the south west and has no facilities other than that provided by the nearby fort. Access is fairly easy although it requires a bit of a climb down (and up). Parking is straightforward. Maximum depth is around 10m. Although this site is not often dived, it makes a perfect sunny Saturday afternoon dive. There is a lot of life present especially if you dive towards the rocky edges of the beach. The southward edge is particularly good. Can be dived in virtually any weather conditions – but slack water is absolutely essential unless you want to be swept along the busy waterway of the Tamar. Be careful of fishing lines. There is an extensive car park, but you have to walk a hundred yards or so in full kit before you reach the steps down to the entry point. Make sure that your car is locked. SX 463 534. An excellent diving area. It offers a lot of diving possibilities – a shallow reef dive, wall dive, deep dive (45m). The underwater life is surprisingly diverse and there’s many artefacts and ship stuff to find. It’s important to do this site the first few times with someone who knows it. A compass is needed since if you lose your way on this site you could end up in the busy shipping channel or even end up in the ferry port. Eastern Kings is near to Devil’s Point and so also needs slack water (on the HW and LW). The high water slack is best since the water is likely to have better vis and shore entry is easier. Possible to road park nearby or else use the extensive car park. Toilets and even a cafe are “on site”. SX 674 420. This is a superb site. 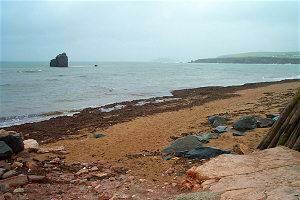 Situated near to Thurlestone Golf Club it is a nice sandy beach that gives good access to the famous Louis Sheid wreck. The beach faces south west so it is prone to the prevailing south west winds that this area experiences. In the day time, parking is only possible in the nearby golf club (small fee exacted), but in the evening or at night one can often park quite close to the beach. There are no facilities, so it is not really suitable for anyone other than keen divers, although beach barbecues are common. Maximum depth 10m. The vis can be over 10m. No tide problems. At night this place is dark and isolated apart from a few summertime anglers. Look out for fishing lines as you approach the beach. There are a number of possible dives. Go to the Louis Sheid (southerly direction). This is an excellent dive but it needs fairly good navigation skills to get back without surfacing. Finding the wreck at night can be difficult. Go out in a south-westerly direction. Navigation is straightforward. At night, the sandy bottom is surprisingly full of life and well worth diving. Go straight out (SW) but hug the rocks around Warren Point. SX 676 414. Another popular shore dive. Despite being near Thurlestone, this site can be quite difficult to find, since there is a profusion of small Devon lanes that leads to it. The beach faces south west but otherwise is safely sheltered. car parking is easy, as is the access. Limited beach facilities although there are some excellent cliff walks nearby. Maximum depth 10m. The usual dive pattern is to swim (or dive) out to the rock. 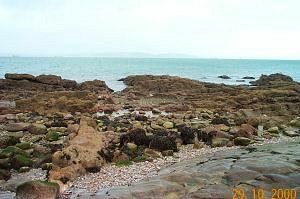 There is a mass of shallow seaweed covered rocks with narrow gulleys in between. There is much life. In some of the gulleys there are the remains of a couple of wrecks. To the seaward side of the rock the water gets a bit deeper and turns to a sandier bottom. It is best to dive this site at high water. SX 929 655. 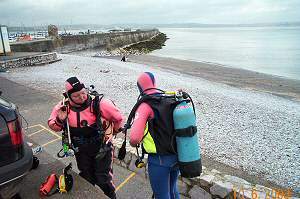 Babbacombe beach is good for novice, training and night dives. There are 3 types of dive to do. First is within the bay itself. 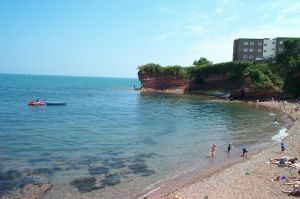 The sea bottom in the bay is sandy with clumps of reef and rocks especially round the headlands. In season, lots of boats are around either moving or moored. A SMB is really quite essential although care must be taken not to entangle with mooring lines. The second is to head southwards to Long Quarry Point where there is a lot to see in quite shallow water. Avoid fishermen at the end of the pier. A good variety of sea life. The third dive is to head up northwards towards Oddicombe beach. Petit Tor Point is the rocky outcrop at the far northern end of the beach and offers safe diving in shallow water with gullies. Underwater caves that are reasonably safe although stirred up bottom can give poor vis. Best done at High water. Fair bit of kelp. 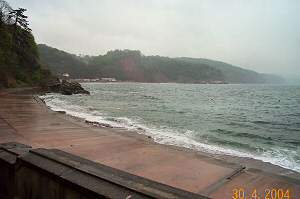 Babbacombe is awkward at Low water but good in most conditions except North East / Easterly winds such as are shown in the picture when shore diving is clearly not on. Depths up to 10m. A very steep road approach so be careful with car brakes. Good facilities – toilets and a pub. SX 933 633. A favourite night dive site, although it is also good in the day. Access is easy as is the parking (at night). Dive facilities in the day time, and it is a popular tourist beach. The slipway gives a good entry to the beach. The usual dive plan is to swim out to the nearby East Shag rock and then dive back into shore. Maximum depth is around 10m and there is little tidal flow. Vis reasonable – 4 to 8m is common. Faces the east. Meadfoot consists of low reef separated by sand. There are a few kelpy bits especially around the rock. At night, there is a lot to see. There are many species of fish (red mullet and cuttlefish are especially common), and near to the shore the diver will usually pass over frenetic sand eels. Because of the lights on the shore, night diving is straightforward in case of problems. However, local people and holidaymakers use the beach at night and it is surprisingly easy to alarm some of them when dark, dripping divers emerge from the water like creatures from the Black Lagoon. Tourists can find lights underwater quite odd and there have been a few false alarms to the coastguard. There may be nets laid by local fishermen.